If you are in the North West of England next weekend (7/8 October) why not pop over to Liverpool and visit the largest Photographic Exhibition in the region. DIGITAL SPLASH takes place at the Liverpool Arena and along with Matt Hart, I will be giving free talks over the two days. It will be great to see you, so please come along to the FUJI stand and you will be sure of a warm welcome. I have just returned from Wast Water where I spent a couple of days teaching in conditions that swung from wild to wonderful. Maurice on day one of his workshop decided to get down low to take the shot. You literally couldn't stand as the force of the wind was so strong! You couldn't have made consecutive days so different. On Wednesday we experienced some of the most ferocious winds I have had to deal with and the howling gales literally knocked you off your feet. You couldn't put a tripod up not even weighted down so we worked hand held. Thursday was simply sublime. Beautiful mirrored reflections and hardly a breath of a breeze. Day Two. what a contrast! Maurice had travelled up from Brighton and was treated to the different faces of the lakes and I was glad that the weather didn't play ball. It is good to be able to work and capture images in all conditions and we certainly had that. It was a cracking couple of days. 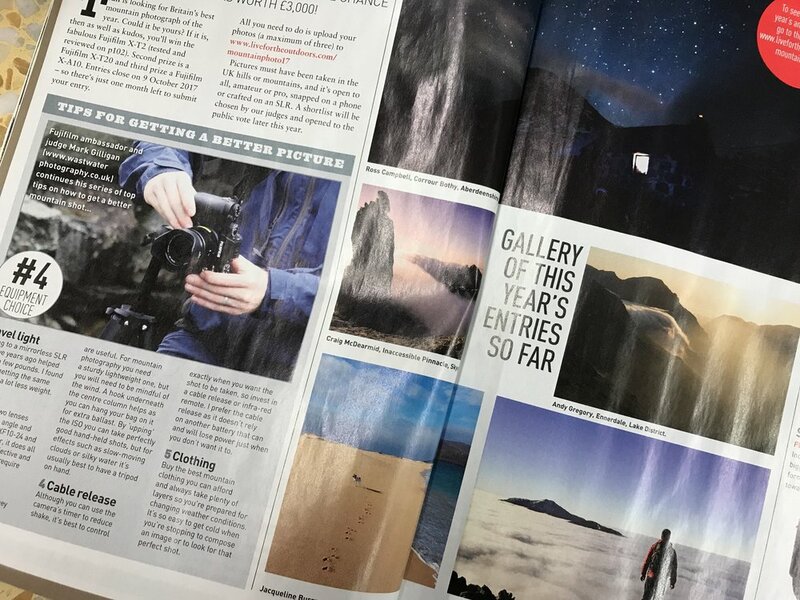 In other news, my articles regarding the TRAIL MAGAZINE Mountain Photo of the Year continue in the latest issue and I look forward to judging the entries towards the back of the year. Will report back in a few weeks. In the meantime enjoy your photography and lets see how the autumn colours display themselves this year.